Jessica Chastain plays Molly Bloom, a young woman on track to ski in the Olympics, until a freak accident wrecks her dream. She heads to L.A., and discovers the underground world of high stakes poker. Soon, she's running her own game, running out of town, starting another game in New York, and feeling the muscle of the local good fellas. 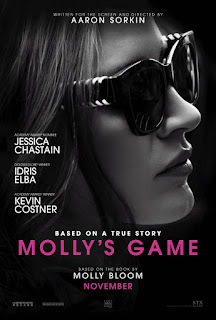 Much of this story takes place in the law office, where Idris Elba listens to Molly's explanation for the life that might land her in jail. Aaron Sorkin wrote and directed. Sorkin loves language. I wish people really talked the way they do in Sorkin's world. Two-thirds of the way through, the story turns exhaustive. A third act conclusion feels false and contrived. 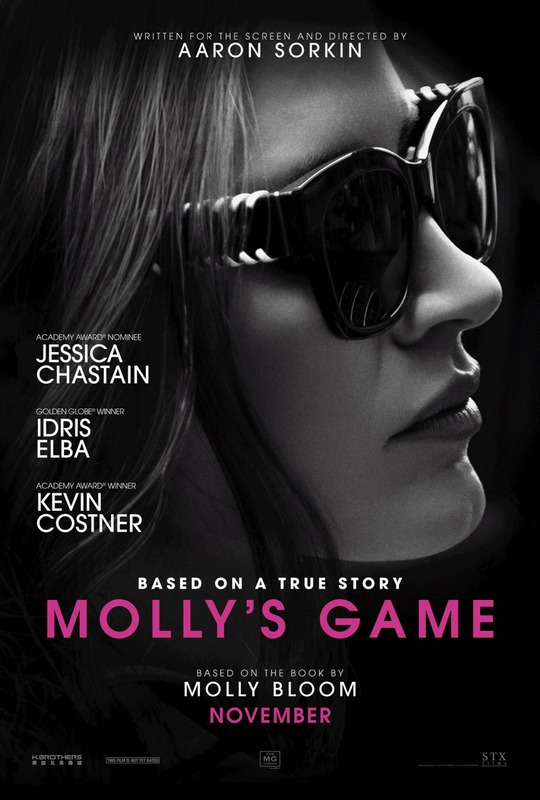 "Molly's Game," rated "R," 2½ stars. Does it deliver what it promises? Starts great, but falters. Is it entertaining? Until it gets too long. Is it worth the price of admission? A near miss.